It’s cozy season. Let’s make banana pancakes! 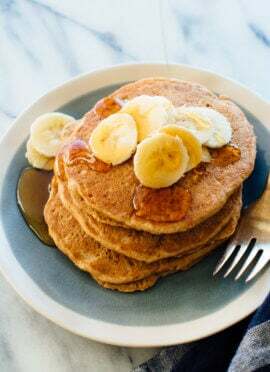 This banana pancake recipe yields gloriously fluffy pancakes, even though they’re made with hearty whole wheat flour. These whole grain pancakes have more substance than your average pancake, which means they can actually fuel you until lunchtime. I like to dollop them with some peanut butter for some extra fiber and protein. I adapted these pancakes from the banana coconut pancakes in Love Real Food (page 17). If you haven’t tried those yet, you’ve been missing out! These are more classic banana pancakes, and I managed to incorporate a little more mashed banana for maximum banana flavor. These banana pancakes are perfect for lazy weekends, and reheat well for busy weekday breakfasts. You can also double the batch and freeze extras for later. They definitely brighten up cold gray mornings, which is what we’ve been having lately. 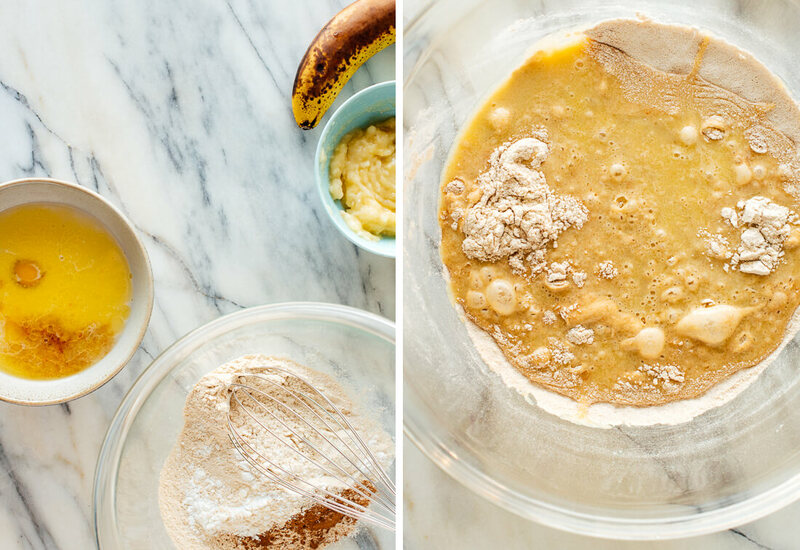 Make these pancakes with the random leftover bananas on the counter. Overripe bananas are perfect! Always make pancakes by hand (not with an electric mixer). Over-mixing the batter yields rubbery pancakes. Simply combine the wet and dry ingredients as instructed. Stir them together with a big spoon until no big powdery lumps remain. Griddles are great because you can make more pancakes at once. Electric griddles are nice because the temperature stays constant. If you’re cooking on the stovetop, you may need to dial back the heat a bit over time. Your temperature is too high if the pancakes are golden on the outside but still raw on the inside. The pancakes are ready to flip when about 1/2-inch of the perimeter has turned from glossy to matte. Better to wait a little too long to be safe than to end up with a doughy mess. After stirring together the wet and dry ingredients, you can gently fold in fresh blueberries or chopped strawberries (up to 1 cup) or chocolate chips (up to 1/2 cup). Top your pancakes with homemade fruit compote, almond butter, pecan butter or whipped cream! Please let me know how these pancakes turn out for you in the comments. I hope these become weekend recipe to look forward to. 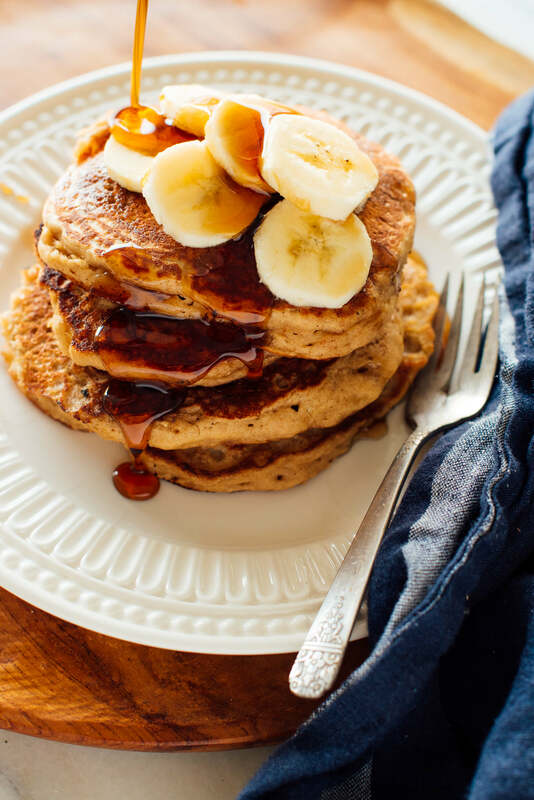 These banana pancakes are so fluffy, no one will guess they’re made with whole wheat flour! 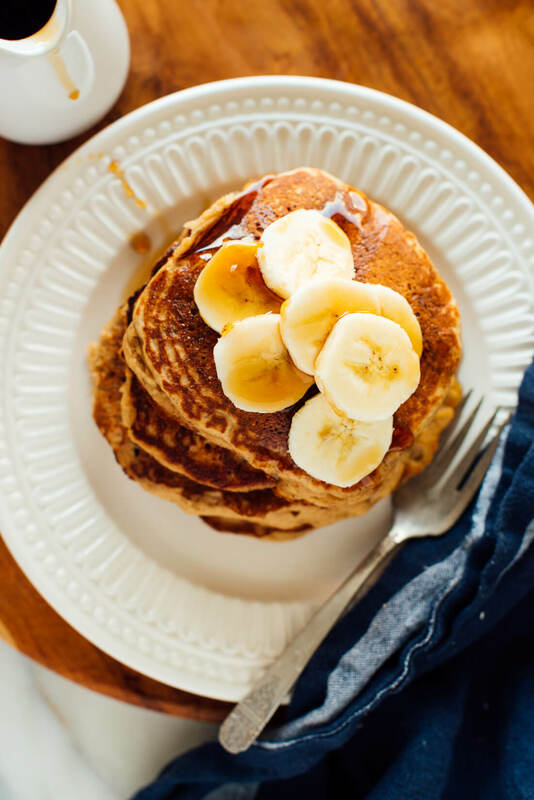 Top these whole wheat pancakes with peanut butter and sliced bananas for extra protein and fiber. Recipe yields 6 to 7 pancakes (enough for 2 to 3 people); double the amounts for a family or more leftovers. If you’re using an electric skillet, preheat it to 350 degrees Fahrenheit now. In a medium bowl, combine the flour, baking powder, cinnamon and salt. Whisk to blend. In a smaller bowl, combine the milk, mashed banana, egg, maple syrup, butter and vanilla. Whisk until blended. Pour the liquid mixture into the flour mixture and mix just until combined. If you are not using an electric skillet, heat a heavy cast iron skillet or nonstick griddle over medium-low heat. You’re ready to start cooking pancakes once a drop of water sizzles on contact with the hot surface. If necessary, lightly oil the cooking surface with additional butter or coconut oil, carefully wiping up excess with a paper towel (nonstick surfaces likely won’t require any oil). Using a ⅓-cup measuring cup, scoop the batter onto the hot skillet, leaving a couple of inches around each pancake for expansion. Cook until small bubbles form on the surface of the pancakes, 2 to 3 minutes (you’ll know it’s ready to flip when about ½-inch of the perimeter is matte instead of glossy). Flip the pancakes, then cook until lightly golden on both sides, 1 to 2 minutes more. Repeat the process with the remaining batter, adding more butter or oil and adjusting the heat as necessary. Serve immediately or keep warm in a 200 degree Fahrenheit oven. If desired, top individual servings with a spread of peanut or almond butter and/or sliced bananas, and serve with more maple syrup or honey on the side. Leftover pancakes can be stored in the refrigerator for up to 3 days, or frozen for up to 3 months. To reheat, stack leftover pancakes and wrap them in a paper towel before gently reheating in the microwave. *Milk options: This recipe will work with cow’s milk, nut milk (almond milk, cashew milk, macadamia milk), soy milk or coconut milk. Make it dairy free: Use non-dairy milk (see list above for a suitable alternative) and coconut oil instead of butter. Make it vegan: See above, omit the egg, and use maple syrup instead of honey. Make it egg free: Simply omit the egg! Make it gluten free: Use gluten-free all-purpose flour blend instead of whole wheat flour. I have been enjoying making my pancakes each week-end. What started out with just another batch, has turned into a mini -obsession with recipes and techniques. Been considering actually adding bananas to the mix. Now I know. 1Tbsp to 1c of flour sounds a lot? I generally sour my milk. Try adding some Rose Water or Orange blossom water? I added both orange zest, juice and blossom last week-end. The other addition was to UB White flour of. another 1/4c of nut flour in this case, hazel.One mean pancake … hehe. Try out Jaggery Door for sweetener. Lot of flavour in that sugar. Thanks for sharing your variations, James! I made these vegan by making a flax egg and I used 2/3 cup mashed banana instead of 1/2 cup, vegan butter, and flax milk and they are so amazing and filling. I love the idea of adding the maple syrup and butter to your batter also the little bit of cinnamon smells amazing! Thank you so much for the recipe! Perfect for this rainy day here in California! There’s nothing better than banana pancakes! Agreed! Pancakes in general, right?! Just got to reading this recipe before dinner..omg the perfect comfort food, they were delicious and fluffy! Thanks Kate. I’m happy to hear that, Nancy! These pancakes look so delicious and would make a great addition on weekend brunch! I’m glad you think so, Natalie! Oh my! Was wondering what I was gonna do with those last 2 bananas! These are scrumptious! Followed the recipe with no changes on my electric griddle…just had my second pancake and going out for a ski to wear it off! Thank you cookie and Kate! I’m glad this was the recipe you needed! Thanks for sharing, Anita. These are amazing!!! My new favorite pancake recipe. Thanks so much! What is your favorite griddle? Hi Sarah! Wish I had a better answer for you, but I have a discontinued Calphalon griddle. It’s non-stick, which I usually avoid, but so darn convenient to cook on. Mine folds in half and has reversible plates (the other side has grill lines) so that might be a nice feature to look for. I think that Cuisinart makes something similar. Enjoyed them greatly! Wonderful flavor! I’m happy to hear that, Helen! Great breakfast! Very light and fluffy pancakes! I’m not much of a breakfast person but I do loooove pankcakes! I’d have to make them for a brunch kind of meal. Maybe with a mimosa or two haha great recipe! I love checking out new recipes and you do put out a lot of good ones, I appreciate it. Banana pancakes truly are a gem. It may be Christmas now, and people are starting to prefer chocolate chip pancakes or pancakes that taste like Christmas cookies, but hey, you can’t go wrong with the classic ol’ monkey business pancakes either! 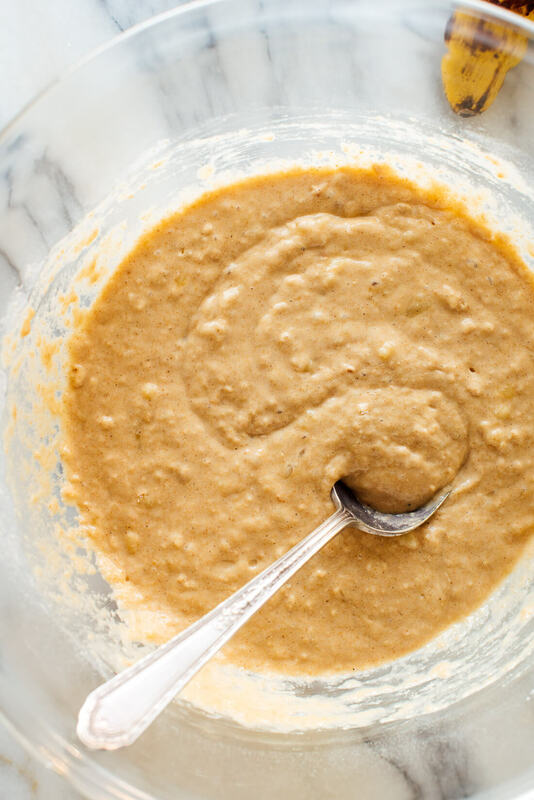 Love that this recipe is whole wheat to make the batter a bit healthier. Hopefully this recipe works with a flax egg! Hi, just made these pancakes vegan style. They were outstanding! Your recipes have made going completely vegan so much easier and tastier. Thank you so much! Love that! Thanks, Steve for sharing. I appreciate the review. Another great recipe!! We followed step by step the recipe and they were amazing! My British husband, our 2 year-old son and I have really enjoyed these pancakes for weekend breakfasts. Last time we made a double batch and freezed for working days (they are now a new favorite for my son). One of my top 3, together with your Triple Coconut Granola & Healthy banana bread. I love that! It’s great when the whole family can love them. Thanks so much, Paola. I appreciate your review! These are so good! Its just a lazy Saturday and making pancakes was the best decision. These pancakes are not too sweet and have the best banana taste. Thanks so much for the pancakes! You’re welcome, Olivia! Thanks for your review. Love these pancakes! Your whole-wheat pancakes are a favourite, but these might be my new staple. I double the batch and then freeze the rest. I wrap individually then pop them in the toaster and they are perfect for feeding my one year old. I love that! Great option to pull out for quicker mornings. Thanks for your review! I just made these pancakes. I wished I had tried them, but my daughter and her friend gobbled them all up! :-)They said they were delicious! So I will definitely make them again. I used regular milk because her friend is allergic to nuts and I used coconut oil. Thank you Kate for another great recipe!! You’re welcome, Marisa! Thanks for your review. We’re not banana fans. Let me assure you that you can make this recipe subbing pumpkin or squash puree for the banana and it will be amazing (ok, better in my opinion, but we don’t need to compete). Yum. I agree! Perfect weekend treat. Thanks for sharing, Claire. Thanks for stopping to comment, Malia! This is definitely my go-to pancake recipe. It’s so easy and delicious, and I love that I can get away with using one banana every time. Today I forgot to add an egg and barely noticed, so this is a perfect vegan option. Thank you! I love that! Thank you for sharing that it worked well without and egg for you, Annie. Happy to hear that, Brigid! Thanks for your review. I am not a huge fan of “ripe” bananas and usually avoid those recipes but I wanted to change up my morning routine and these pancakes were very tasty. I topped with a compote of smooshed mixed berries/cherries. I want to experiment using less oil next time, or maybe cut out the syrup – try to make it a bit more WW friendly. Thanks for all the work you do. Eating healthier and cleaner is so much easier with you around! I’ve been making these every weekend with just one tbsp each of oil and honey, plus about a half cup of blueberries. They are the perfect pre-workout breakfast! Thanks for sharing, Rita! I love blueberries as a topping to. I appreciate the review! These are the perfect pancakes!! I’ve now made them twice in two weeks, with rave reviews from hubby and kiddo. 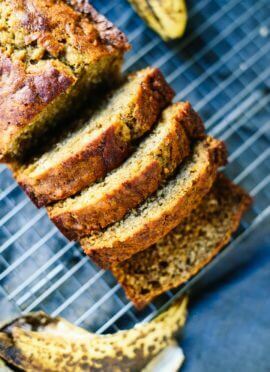 They have a great banana/cinnamon flavor, and work really well with the whole wheat flour (I’ve tried white and whole wheat– I really couldn’t tell the difference).I use a little more milk than called for– about 3/4 cup. Thank you Kate (and Cookie)! Thanks for sharing, Janelle! I appreciate the review. Another winner! I have been tethered to the kitchen every Sunday morning since discovering this recipe. 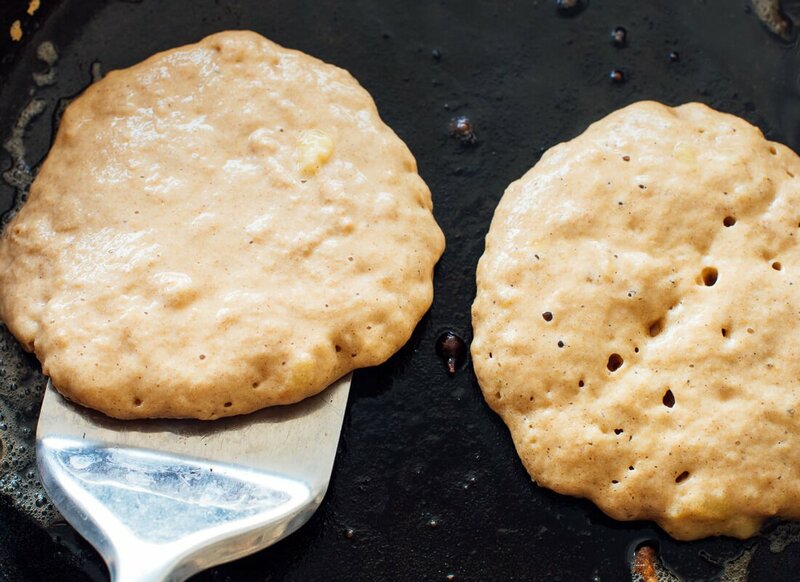 By subbing in some moistened ground flax seed for the egg and agave syrup for the honey, these are easily turned into vegan pancakes and my family continually ask for them – I often triple the recipe. Thanks Kate! Yum! These were the best! I followed recipe using white whole wheat flour, coconut oil, maple syrup and almond milk. Thank you for sharing, Halina! Made these for breakfast this morning. Rave reviews! Fluffy! Thank you, Jill! Fluffy pancakes are the best. We have made these 3 different times now and they’ve come out perfectly each time. 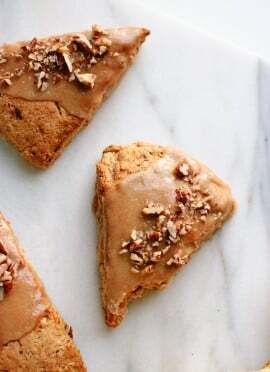 I love that the recipe is very “variation-friendly” – we have increased the cinnamon, included flax meal, used half maple syrup-half honey, etc etc and have loved them each time. Thank you for our new weekend staple!